About 4.1 million Californians, or 70 percent of those eligible, are enrolled in the food assistance program known as CalFresh. That leaves about 2 million people out, according to 2015 federal data cited in a January report. Just three states — Utah, North Dakota and Wyoming — have lower rates of participation, according to the latest available federal data released this year. Meanwhile, California is among the leaders on enrollment in Medi-Cal, the state's version of Medicaid, which also serves people living in low-income households. 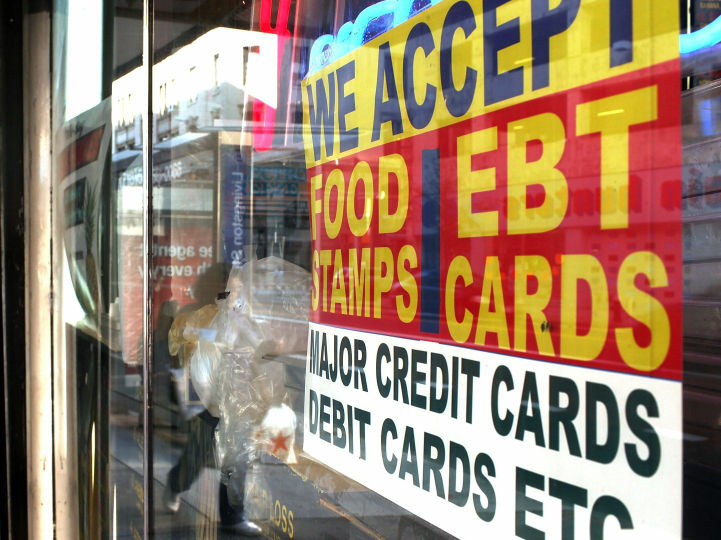 The reasons for California's low food stamp participation rate remain a "persistent puzzle," says Kim McCoy Wade, chief of the CalFresh branch of the state's Department of Social Services. But she and others suggest historically poor customer service and a bulky bureaucracy have something to do with it. About 4.1 million Californians, or 70 percent of those eligible, are enrolled in the food assistance program known as CalFresh. That leaves about 2 million people out, according to 2015 federal data cited in a January report. The national average is 83 percent enrolled. Yet only about 322,000 people who qualify for Medi-Cal aren't signed up, according to a 2016 report by University of California-Berkeley researchers. The researchers estimate that more than 90 percent of those eligible for Medi-Cal who don't have another source of insurance are enrolled. Medi-Cal now serves more than 13.5 million people, a number boosted significantly by Medicaid's recent expansion under the Affordable Care Act. To address this gap between food assistance and medical assistance, California has begun leveraging its vast pool of new Medi-Cal beneficiaries to boost enrollment in CalFresh. Officials are building upon relationships between county welfare departments and new Medi-Cal enrollees, using electronic records on Medicaid recipients to identify food stamp candidates and then are guiding them through the enrollment process. "We are taking the successes from the Affordable Care Act and are turning to our next-biggest program and trying to apply those lessons," says McCoy Wade. "The Medi-Cal/CalFresh connection is something where we think there is a lot of room to grow." The push comes as both Medicaid and the Supplemental Nutrition Assistance Program, or SNAP, are under threat from Washington, D.C. Just this month, Republicans in Congress unveiled a farm bill that would mandate stricter work requirements for SNAP beneficiaries. Several times over the past few years, President Donald Trump and congressional Republicans have proposed overhauling the Medicaid program to rein in costs. One of California's challenges with the food stamp program is that it is administered at the county level — and there are 58 counties. Only 10 states run their programs that way. "Because we are decentralized ... it takes us longer to move the whole ship," McCoy Wade says. However, Medicaid, too, is run by counties, and has been more successful in signing people up. "Doing things to help integrate the programs can be mutually beneficial, both for saving on administrative costs and being able to enroll more families," says Michael Katz, a research associate at the Urban Institute. Still, SNAP and Medicaid have different eligibility rules. "It's not a perfect overlap, but it is a pretty close Venn diagram," says Jared Call, managing nutrition policy advocate at California Food Policy Advocates, which works to help low-income families access healthy food. Several California counties have tried to be proactive in enrolling food stamp candidates from among Medi-Cal beneficiaries. San Francisco County placed a CalFresh eligibility worker at a public hospital and a community clinic. Los Angeles County mailed over 1 million flyers to Medi-Cal recipients who potentially qualified for food stamps. San Bernardino County has self-service kiosks and staff members at the entrances of county offices who help people enroll in CalFresh if they are interested. "It's a one-stop shop," said Nancy Hillsdale, who manages a county government office in Colton, Calif. In San Diego County, officials printed CalFresh materials for health fairs and sent texts to everyone who applied for Medi-Cal with a link to apply for the food benefits, says Rick Wanne, director of eligibility operations for the county. Wanne points out that enrolling people in CalFresh is a lot tougher than enrolling them in Medicaid. "There is a laundry list of long-standing ... rules and regulations that make it difficult to get on the program," he says. For example, applicants for CalFresh must be re-interviewed every year and update their information every six months. Medicaid, by contrast, does annual renewals without requiring interviews. McCoy Wade says CalFresh eliminated some of the most burdensome requirements, including providing fingerprints, and it's starting to make a difference. The state increased its participation rate from 67 percent in 2014 to 70 percent in 2015, according to the January report. That occurred as the economy improved and fewer needed the help. "We are closing the gap," she says. Still, participation can be hampered by other challenges. Lack of transportation, long lines at county offices and lack of flexibility in setting appointment times may also contribute to low participation, county officials said. And paperwork often gets mailed to residences, making it harder for homeless people or those who move frequently to stay enrolled. That's what happened to 25-year-old Crystle Conant, who lives only part time at her father's house in San Bernardino County. "When I swipe my card at the store and it gets declined, then I know," she said. "I haven't renewed in time."